PAID INTERNSHIPS W/ Urban Art Commission (2 available). This position is responsible for updating UAC’s contact database, helping to improve efficiency of organizational communications with UAC artists and supporters. The Database Intern will also work closely with the Program Coordinator to digitize paper files during UAC’s office relocation. To apply, please send a brief letter of interest (including your weekday availability) and resume (not to exceed 1 page) with the subject line “Communications Database Intern” to: HR@urbanartcommission.org. This position is responsible for assessing and updating UAC’s database of completed projects, including the Moveable Collection. The Database Intern will work closely with the Program Coordinator and Project Management team to compile project information in a consistent format that can be referenced as a resource both internally and externally. To apply, please send a brief letter of interest (including your weekday availability) and resume (not to exceed 1 page) with the subject line “Project Database Intern” to: HR@urbanartcommission.org. 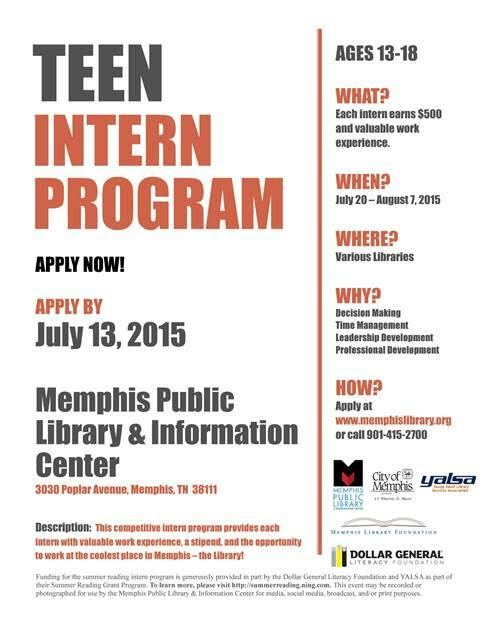 Summer Teen Internship at the Memphis Public Library & Information Center​!!! Ages 13-18, $500 stipend, July 20-August 7. Various library locations across the city of #Memphis. Apply by Monday, July 13th. St. Jude’s Summer Volunteen Program applications now accepted! The hospital is now accepting applications for this summer’s St. Jude Volunteen Program. Teens will participate in a summer experience of learning, personal growth and creative fun while serving patients, siblings and parents. Sessions include opportunities to explore possible career paths and develop leadership and team-building skills while fostering self-awareness. Refer interested teenagers to http://www.stjude.org/volunteens. The application deadline is Monday, March 9 at noon. Students enrolled at least half-time basis at a qualifying educational institution. The Equal Employment Opportunity Commission (EEOC) is seeking participants for the Pathways program. The agency is composed of a highly motivated and diverse team dedicated to the agency’s mission – to eradicate employment discrimination. Come join us and make a difference. PATHWAYS INTERNSHIP PROGRAM OVERVIEW: The Pathways Internship Program is designed to provide students enrolled in a wide variety of educational institutions, from high school to graduate level, with paid work opportunities in agencies to explore Federal careers while still in school. The Internship provides managers a ready source of student employees and potential permanent employees upon completion of the program requirements. It also provides the student with work experience directly related to the curriculum studies or career goals while offering eligibility for non-competitive conversion to permanent employment upon completion. CONVERSION: This appointment may be extended until the selectee’s education program requirements have been completed, at which time the individual may, at agency’s discretion, be converted to a term or permanent appointment. There is no guarantee for conversion. You must be a U.S. citizen or National to apply for this job. Subject to a background investigation. Be at least 16 years old by the closing date of this announcement. Accepted for or currently enrolled in a qualified educational institution. A qualified typist is required. Incumbent participates as part of the Equal Employment Opportunity Commission’s Pathways Student Intership Program. This program integrates on-the-job training with pertinent education in a specific field of learning. He/she will serve as a student trainee by assisting the staff in accomplishing day-to-day duties. Assignments become more responsible as incumbent increases knowledge and skills through work experience and academic training. Work Environment: The work environment includes everyday risks or discomforts which require normal safety precautions typical of offices, meetings and training rooms. Work Schedule: Part-Time, Monday – Friday, 20 hours per week. Your rating will be based on your responses to the Assessment Questionnaire and the information stated in your resume. The assessment questions relate to the following competencies that are required to perform the work of this position. Knowledge of clerical tasks and processes. Ability to use computer equipment to record, manage, and present data. Applicants must meet all qualifications requirements by the closing date of this announcement. Internship Program: To be eligible, applicants must be accepted for enrollment or currently enrolled and seeking a degree (diploma, certificate, etc.) in a qualifying educational institution, on a full- or half-time basis. Specialized Experience: There is no specialized experience required for this position. General Experience: Six months of general experience is required. For this position, general experience is defined as progressively responsible clerical, office, or other work that indicates the ability to perform the duties of this position. Physical Requirements: The work is sedentary. Typically, the employee sits comfortably to do the work. There may be some walking, standing, bending, carrying of light items such as paper, books, or small parts. No special physical demands are required to perform the work. Veterans’ Preference: When applying for Federal Jobs, eligible Veterans should claim preference on the Occupational Questionnaire in the section provided and provide a legible copy of your DD214(s) and/or documentation related to your active duty service which shows dates of service, character of service (honorable, general, etc. ), or dates of impending separation. Additionally, disabled veterans and others eligible for 10-point preference (such as widows or mothers of eligible Veterans) must also submit an SF-15 “Application for 10 Point Veterans Preference” with required proof as stated on the form. For more information, please review the information for disabled Veterans in the application checklist or visit http://www.fedshirevets.gov/job/vetpref/index.aspx. NOTE: YOU MUST PROVIDE PROOF OF ENROLLMENT ALONG WITH YOUR TRANSCRIPTS. FAILURE TO DO SO WILL RESULT IN LOSS OF CONSIDERATION. PLEASE NOTE: Education must be accredited by an accrediting institution recognized by the U.S. Department of Education in order for it to be credited towards qualifications (particularly positions with a positive education requirement.) Therefore, applicants must report only attendance and/or degrees from schools accredited by accrediting institutions recognized by the U.S. Department of Education. Applicants can verify accreditation at the following website: http://www.ed.gov/admins/finaid/accred/index.html. All education claimed by applicants will be verified by the appointing agency accordingly. If you are using foreign education to meet qualification requirements, you must send a Certificate of Foreign Equivalency with your transcript in order to receive credit for that education. Your resume and/or supporting documentation will be verified during the review process. If your resume/application does not support your questionnaire answers, we will not allow credit for your response(s). Please follow all instructions carefully. Errors or omissions may affect your rating or consideration for employment. • your appointment follows, with a break in service of no more than 3 days, a position in which you were insured. • expected to work less than 6 months in each year. To apply for this position, you must complete the occupational questionnaire and submit the documentation specified in Required Documents. You must submit a complete application package by 11:59 p.m. Eastern Standard/Daylight Savings Time on the closing date of the announcement. Failure to provide all required documents will result in you not being considered for employment. To verify your application is complete, log into your USAJOBS account, https://my.usajobs.gov/Account/Login, select the Application Status link and then select themore information link for this position. The Details page will display the status of your application, the documentation received and processed, and any correspondence the agency has sent related to this application. Your uploaded documents may take several hours to clear the virus scan process. To fax your documents, you must use the following cover page http://staffing.opm.gov/pdf/usascover.pdf and provide the required information. The Vacancy ID is . If you cannot complete the Application Package online, you may fax all of your materials. The complete application package must be submitted by 11:59 PM (EST) on the closing date of the announcement to receive consideration. Keep a copy of your fax confirmation in the event verification is needed. Click the following link to view and print the occupational questionnaire View Occupational Questionnaire. Resumes/Applications and supporting documentation will NOT be accepted by mail. Should you need assistance please contact the individual identified in this announcement at least 2 days prior to the closing date. #Internship Alert! w/Youth Villages Applicant must be a college student (Junior OR age 21) pursuing bachelors or masters in social services. Contact franklin@goldengatecathedral.org for more info. The City of Memphis will begin accepting applications for new participants in the program on February 28, 2011. This is a year round program. Those of you that are already in the program need not reapply. If you know of someone that will be entering the 10th, 11th, or 12 th grade in the fall of 2011, please share the information below. Memphis , TN – The City of Memphis Office of Youth Services and Community Affairs announced the application period for the Memphis Ambassadors Program (MAP) year-round enrichment program. All applicants must be rising 10th, 11th and 12th graders, and live within the city limits of Memphis. Interested participants must visit http://youth.memphistn.gov and complete an online application during February 28 – March 25, 2011. Using a random computer-based lottery process, applicants will be selected by Memphis City Council District and given a rank during the first week of April 2011. The highest ranking applicants will be invited to an interview. Once selected, MAP participants will receive quarterly stipends based on program attendance and participation. MAP integrates community, business, and neighborhood alliances and provides a curriculum based on four core values: Education, Health, Civic and Social Responsibility, and Employability. MAP also provides Service Learning Opportunities, Youth Leadership Development, Post Secondary Preparation, Cultural Enrichment, Life Skills Training, Career Exploration, Financial Literacy, and other youth-oriented activities. The program operates out of nine sites throughout the seven Memphis City Council Districts. Each site is supported by a community cluster, which includes faith-based institutions, businesses, schools, neighborhood organizations, non-profits, government agencies, parents, and volunteers. For information, please contact the Office of Youth Services at 901-576-6264 or visit www.cityofmemphis.org.